FALL 2018 7 E D I T O R ' S N O T E You'll find writers and showrunners, art directors and production designers, CG riggers and lighters, storyboard artists and color stylists, technical directors and effects artists, to name just a few. I am consistently awed by the depth of creativity, innovation and imagination in this group, and how truly collaborative the process of animation can be. The importance of shared contribution is evident, for example, in our feature on Ralph Breaks the Internet (p. 34), where we looked at five different departments and their roles in the film. A different kind of contribution, one anchored in personal experience, is explored in "The Art of Inclusion" (p.22), an article that focuses on how we can reflect different cultures into our work. To the outside world, The Animation Guild is a collective of artists who only draw but we know we are much more than that—we're a force of creators. Cheers, Alexandra Drosu editor@tag839.org P.S. Do you have an Etsy shop? Do you print your own t-shirts? Have you published a book? I want to hear from you for our first gift guide that features only items created by TAG members. 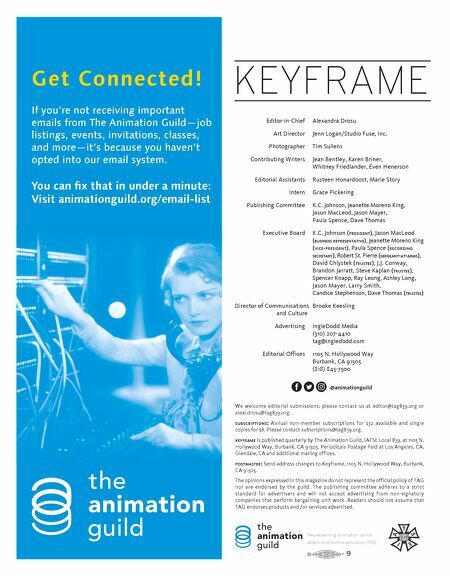 THE ANIMATION GUILD IS UNLIKE ANY OTHER LOCAL IN THE UNION BECAUSE OF THE VARIETY OF JOBS THAT FALL UNDER IT. 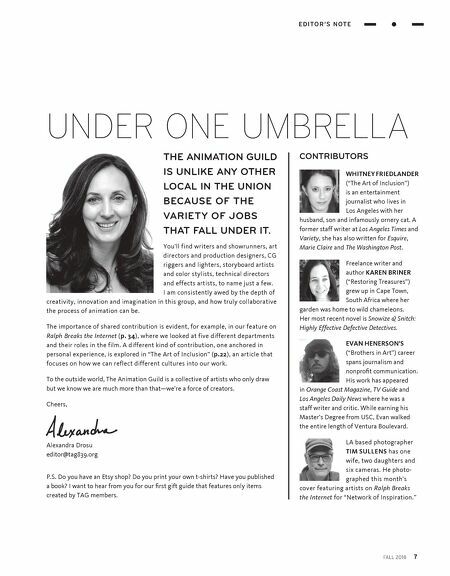 UNDER ONE UMBRELLA CONTRIBUTORS WHITNEY FRIEDLANDER ("The Art of Inclusion") is an entertainment journalist who lives in Los Angeles with her husband, son and infamously ornery cat. A former staff writer at Los Angeles Times and Variety, she has also written for Esquire, Marie Claire and The Washington Post. Freelance writer and author KAREN BRINER ("Restoring Treasures") grew up in Cape Town, South Africa where her garden was home to wild chameleons. Her most recent novel is Snowize & Snitch: Highly Effective Defective Detectives. EVAN HENERSON'S ("Brothers in Art") career spans journalism and nonprofit communication. His work has appeared in Orange Coast Magazine, TV Guide and Los Angeles Daily News where he was a staff writer and critic. While earning his Master's Degree from USC, Evan walked the entire length of Ventura Boulevard. LA based photographer TIM SULLENS has one wife, two daughters and six cameras. He photo- graphed this month's cover featuring artists on Ralph Breaks the Internet for "Network of Inspiration."